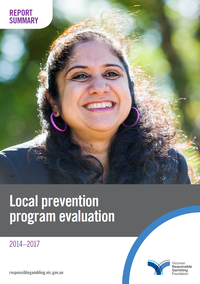 This document provides a summary of the Local Prevention Program evaluation findings. The evaluation focused primarily on the results and impacts of 17 funded projects delivered as part of phase 2 of the program, which ran from December 2015 to June 2017. The projects were diverse and directed at a range of settings and populations, including culturally and linguistically diverse (CALD) groups, Victorian Aboriginal communities, young men and workplaces. Victorian Responsible Gambling Foundation 2018, Local Prevention Program evaluation summary 2014 – 2017, Melbourne.